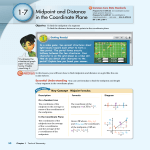 Find the coordinate of the midpoint of the segment with the given endpoints. Find the coordinates of the midpoint of AB . III. Which quadrant contains point B? Explain. Copyright © by Pearson Education, Inc., or its affiliates. All Rights Reserved. 29. Coordinate Geometry Graph the points A(0, 0), B(3, 3), C(9, 3), and D(12, 0). intersection of diagonals AC and BD . a. Find BE and CE. What do you notice? b. Find AE and DE. What do you notice? 30. Open-Ended Point B(3, 3) is the endpoint of many segments. noncollinear segments that have point B as their endpoint. b. You know that a segment with endpoint B lies entirely in Quadrant III. What does that tell you about the other endpoint? points on a coordinate plane. STUDY GUIDE for Unit 1 Test Geometry 1. Z?